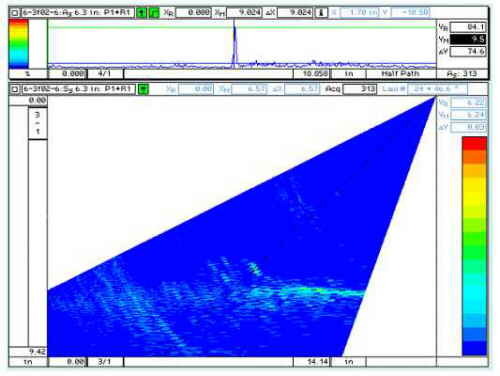 EPRI is using phased array technology to develop several ultrasonic inspection techniques for the electric utility industry. The objective is to increase the economic value of the inspections by decreasing inspection time and simplifying the scanning hardware, while matching or exceeding the flaw detection and sizing capabilities of conventional ultrasonic techniques. EPRI is working closely with utilities and NDE vendor companies to develop probes and procedures, to demonstrated and qualify them, to conduct first field application, and to see the array techniques into routine commercial operation. Commercial field deployments in 1998 include inspection of the stainless steel core shroud of boiling water reactors for detection and sizing of intergranular stress corrosion cracking near the welds, and inspection of turbine disks for detection of cracking in the blade attachment hooks. Also under development are rapid-scan techniques for inspection of boiling water reactor pressure vessel welds, for inspection of austenitic welds, and for inspection of ferritic piping welds. 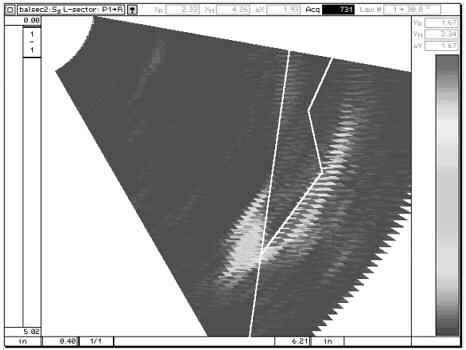 Current ultrasonic examination (UT) techniques require moving a transducer across a component's surface in a time-consuming two-dimensional scan pattern. The time required to execute this scan pattern contributes to labor costs, personnel exposure, and in some situations critical path impact. Phased array technology, under investigation by the EPRI Advanced Nondestructive Evaluation (NDE) Program, offers a means to reduce the scanning time by simplifying the scan pattern. A single array probe can be made to simulate many different conventional probes. Without moving the probe, sound beams of many angles can be generated sequentially, inspecting a large portion of the component's cross-section. To achieve this same coverage using conventional techniques, the probe would have to be moved over the component's surface. In this manner, a slice of a component may be scanned electronically in milliseconds instead of scanned mechanically in a few seconds. The image produced from this type of polar, electronic sweep is called a "sector scan." (This type of image is already known to most people; the familiar wedge-shaped, black-and-white ultrasound images of fetuses are sector scans. In fact, the fetal ultrasound imaging technique is almost exactly the same as ultrasonic sector-scan imaging for inspection of power plant components.) Instead of the slow, two-dimensional scan pattern necessary to scan a weld joint using conventional methods, the probe may simply be swept along the length of the weld once or twice to achieve similar results. In many cases, scan times can be reduced by at least an order of magnitude. There are potential obstacles to implementing these techniques in the field. First of all, the number of NDE vendor companies prepared to offer commercial services including phased array UT in the USA is very limited. Second, the equipment is relatively expensive at this time. It is difficult for an NDE vendor company to invest in phased array equipment and probes without first being assured that there will be a viable market for their use. EPRI's intent is to help make it easier for NDE vendors to equip themselves to offer commercial phased array UT services, by developing and demonstrating qualified, economically valid applications. The Advanced NDE Technology Program is developing phased array ultrasonic examination techniques for various power plant components, including boiling water reactor core shroud welds, stainless steel piping welds, reactor pressure vessel welds, turbine disc rims, and high-energy piping welds. All of these array applications will benefit from increases in examination speed. Some applications will include particular additional benefits that are made possible by the array technology. For example, using an array to examine the blade attachment hooks of a turbine rotor disc will also provide improved characterization of the configuration of the disc rim, which frequently is not known in advance. Array examination of reactor pressure vessel welds eases discrimination between subsurface flaws and those that are actually surface-connected. This discrimination is important because these two flaw categories have different consequences in terms of the flaw evaluation and the reinspection schedule. The primary areas of application development in 1998 include boiling water reactor (BWR) core shroud welds; BWR reactor pressure vessel (RPV) welds; turbine disk blade attachment hooks; pipe weld inspection; and austenitic weld inspection. EPRI is in close contact with several organizations worldwide in order to share information and increase its capabilities in phased array UT. The core shroud of a BWR is a stainless steel cylinder surrounding the reactor core. The shroud is about six meters high and about four meters in diameter. It contains several circumferential and vertical assembly welds which are susceptible to intergranular stress corrosion cracking (IGSCC) and therefore must be inspected periodically. A typical shroud inspection would include about 60 meters of weld. The inspections are usually done using ultrasound. Conventional, high-resolution ultrasonic scans of these welds take about 20 minutes per meter of weld. The scan is performed by moving the transducer in a two-dimensional raster pattern over the surface of the shroud adjacent to the weld (Figure 1). Fig 1: Scan pattern used in conventional inspections of core shroud welds. Fig 2: Scan pattern used in array inspections of core shroud welds. By using an array probe, the inspection cross-sectional area of interest can be covered from just three probe positions. The resulting scan pattern (Figure 2) can be executed with a net production speed of about 10 seconds per foot of weld. Since these inspections are performed inside the reactor vessel during refueling outages, the reduction in scan time can be useful in economically scheduling in-vessel activities. 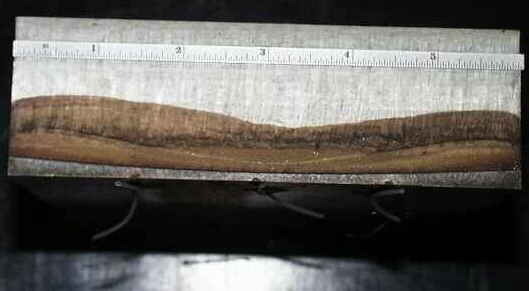 Fig 3a: Image of unflawed area of core shroud weld. Fig 3b: Configuration of core shroud weld. Fig 4a: Core shroud crack connected to opposite surface. The probe is a 2MHz 2x32-element dual array probe with 22mm aperture. At each data acquisition position, a sector scan of 51 beam angles is generated. The individual beams are from 30º to 80º longitudinal waves, in 1º increments. This small angular resolution was used to achieve optimum depth sizing precision. The depth sizing RMS error was about 1.2mm for cracks on the near side of the weld (sound beams do not have to penetrate weld metal). Even with this fine angular resolution, the data file size was smaller than that experienced using conventional UT techniques, because of the simplified scan pattern. An example of the ultrasonic response from an unflawed area of a core shroud weld is shown in Figure 3. Figure 3a shows the configuration of the mockup and the placement of the array probe, while Figure 3b shows the sector scan response. The position of the weld is shown in the sector scan with straight white lines. The diagonal fillet of the weld produces a very strong response, while the vertical weld fusion line produces a light, hazy response. The slight tilt and distortion of the sector scan image is characteristic of the imaging software. An example of the sector-scan response from a crack connected to the opposite surface is shown in Figure 4. The data analyst is presented with a scaled cross-sectional view of the cross-section of the shroud weld region. His analysis task is reduced to noting the presence of the crack reflection, and measuring the crack depth by applying measurement cursors to the image. The simple and intuitive nature of the data presentation also makes it easier for the analyst to explain his results to the utility customer, and if necessary to the regulator or insurer. The sector-scan method of analysis is not only simpler than conventional methods, but is much faster. Even using conventional inspection techniques, the analysis of the ultrasonic data generally takes longer than the acquisition of the data, especially if many flaws are detected. The hours or days between the time the utility learns that its shroud is cracked, and the time the accurate characterization of the extent of the cracking is completed, can be a very tense time indeed. The utility is very anxious to receive the final results as quickly as possible so that the structural analysis of the shroud can be performed, and run/repair decisions can be made. After the core shroud, the application that is perhaps closest to field deployment is the inspection of the BWR pressure vessel underclad region from the outside surface. Like the core shroud application, this technique uses electronic scanning to cover as much of the inspection area as possible from each probe position, thereby permitting the use of an abbreviated, very fast scan pattern. Fig 5: Inspection area for BWR vessel inner surface. The most important region of the pressure vessel to inspect is the inner inch or so of the wall thickness, in and near the welds. This is where cracking is most likely to occur and is also where the stress intensities are high. The inspection area is shown in Figure 5. The industry standard qualification test for this inspection requires the detection of cracks as small as 3mm deep connected to the clad interface. Detection of these small cracks using conventional techniques requires a slow, large-area scan and careful analysis of the data; the signal-to-noise ratio of these small cracks is sometimes low, in part because the sound beam has spread so much by the time it reaches the crack. Fig 6: Using focusing to inspect the vessel inner surface. Fig 7: Scan pattern (one direction) for rapid examination of BWR RPV welds underclad region. EPRI is using a 4MHz, 50mm dual (separate transmit/receive arrays) array probe to generate longitudinal waves that are focused at the inside surface. Because the beam is focused, a greater proportion of the sound energy is returned from the small crack and the signal-to-noise ratio is improved. Without moving the probe, the position of the focal spot is swept along the inside surface in 5mm increments over a range of 300mm (Figure 6). The entire inspection area can be covered from just two probe positions. The probe is scanned parallel to the weld, moved away from the weld by 100mm, and scanned parallel to the weld again (Figure 7). The scan is repeated from the other side of the weld, or else two array probes are used and both scans are done simultaneously. The time saving is even greater than that shown for the core shroud weld, because the conventional scan pattern for the pressure vessel is larger and slower. This technique was used to examine an RPV plate mockup containing eight underclad cracks. All eight cracks were detected, and all eight cracks were shown in each of the four scan lines (two scan lines for each beam direction). The response of a 3mm deep underclad crack is shown in Figure 8. The clad response is visible as a horizontal band in the sector-scan image; the crack response is just above it, in the center of the image. Slightly to the left of the crack response is a small group of responses from unintentional reflectors associated with fabrication of the underclad crack. The A-scan shows the maximum response from the crack, illustrating the excellent signal-to-noise ratio. This technique has been developed and proceduralized in preparation for a formal qualification later in 1998. Inspection vendor companies are already interested in applying this technique in the field, and a candidate demonstration plant will be sought after the qualification is complete. EPRI is developing a method for using array probes to speed the inspection of turbine disk rims. These geometrically complex regions are difficult to inspect using conventional probes, because the configuration of the rim is sometimes not known. Array imaging can be used to compensate for the uncertainty of the part geometry. EPRI is working with a US inspection vendor to refine the array inspection techniques already identified and to deliver a field demonstration. The current UT technique inspects each attachment hook with a dedicated probe of a carefully selected beam angle. The probe must be held at the correct radial position as a circumferential scan is performed. If the radial position is allowed to drift, the scan must be repeated. This process is repeated until all hooks have been examined. See Figure 9 for a schematic of the conventional technique. Fig 9: Conventional UT for turbine disk rims. A separate probe is used for each hook. Fig 10: Sector scan of all hooks on one side simultaneously. Fig 11: Scan pattern (one direction) for rapid examination of BWR RPV welds underclad region. The phased array technique employs a sector scan to examine all the hooks simultaneously, as shown in Figure 10. The technique is not very sensitive to radial position of the probe, and only one circumferential scan is needed on each face of the disk. Figure 11 shows a sector scan of a three-hook disk rim with a crack in the first hook. The rim geometry has been overlaid on the image for clarity. The presence, location, and nature of the defect indication are unmistakable. This image was obtained using a 10MHz, 32-element array of 10mm aperture, generating a longitudinal-wave sector scan of 0.5º resolution. Future steps will include implementing an ability to import CAD drawings of the rim geometry (when available) into the UT data analysis program to overlay on the data as shown in Figure 11, and an investigation of crack depth sizing. EPRI has worked with an inspection vendor company to develop a rapid-scan inspection technique using arrays for high-energy steam piping. This piping can fail by creep fatigue cracking along the longitudinal seam welds. Power plants contain hundreds of feet of this piping, so inspection of the welds is time-consuming. The development is at an early stage, but it appears that it may be practical to deploy a rapid scan for detection of degradation, which would be followed by a more detailed scan for characterization and sizing of detected defects. EPRI is investigating inspection of austenitic pipe welds, particularly for IGSCC, using electromagnetic-acoustic transducers (EMATs), and is also investigating detection and sizing of fatigue cracking inside austenitic weld metal using piezoelectric arrays. EPRI is also developing inspection techniques for stainless steel pipe welds. In some cases, these techniques employ EMATs to generate a special mode of ultrasonic beams. These horizontally polarized shear (SH) beams can penetrate stainless steel welds much better than conventional modes of ultrasound, which gives EMAT inspection an advantage when a weld can be inspected from only one side. The capabilities of EMATs to satisfy the requirements of ASME Section XI Appendix VIII, and significant advantages for flaw detection and length sizing through the weld, have been demonstrated. Efforts to extend that capability to detection of IGSCC have not been as promising. EPRI is investigating the possibility of using higher-frequency or more efficient EMAT probes to improve the detectability of IGSCC. EPRI is investigating the detection and sizing of fatigue cracks in austenitic weld metal. Three cracked specimens have been made from welded 316L stainless steel plates 50mm thick. This work is being conducted in cooperation with Electricité de France. One large plate was sectioned into four specimens (Figure 12). Each specimen received an EDM notch at the edge of the weld root to serve as a crack starter, and then was fatigued to grow a crack (Figure 13). One specimen was fatigued until the crack depth visible on the side of the specimen was about 15mm; the specimen was then heat-tinted, and then fatigued until failure. Figure 14 shows the shape of the crack and the EDM starter notch. The crack depth is fairly uniform, but not perfectly constant, across the 150mm width of the specimen. The remaining three specimens were fatigued until the visible crack depth at the edges was 5mm, 10mm, and 15mm respectively. Fig 12: Sectioning of 316L plate to make four fatigue specimens. Fig 13: Fatiguing configuration. Fig 14: Exposed face of crack that was grown to 15mm depth, heat-tinted, and then fatigued to failure.The slightly curved, 6mm EDM starter notch is visible at the base of the crack. Fig 15: Scan directions for fatigue plates. Each cracked specimen was scanned using a 2MHz, 2x32-element dual array probe with 22mm aperture. At 5mm increments along the weld length, a 51-angle sector scan was obtained. Each sector scan included longitudinal-wave beam angles from 30º to 80º in 1º increments. (This is the same probe and sector scan scheme that was described for BWR core shroud welds.) The weld was scanned from both directions (Figure 15). Figure 16 shows a graph of the crack depth measurements for one of the specimens. The measured crack profile is in good agreement with the two crack depths observed on the sides of the specimen, and with the crack profile shape that was expected based on the shape of the trial crack and the shape of the EDM starter notch. Also, the near-side measurements usually agree well with the far-side measurements. 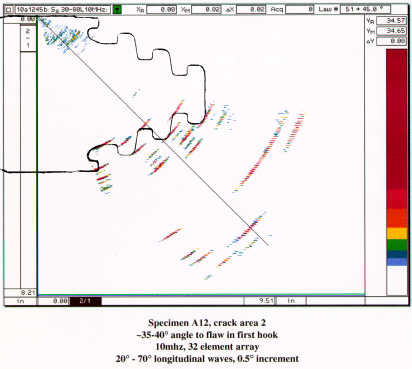 Fig 16: Graph of UT crack depth measurements along one of the fatigue cracks. The next steps in this program will include the removal of the EDM starter notches, rescanning the specimens, and comparison with the responses of EDM notches in the weld of a similar specimen. High-speed phased array inspection of steam generator tubing has been developed and demonstrated outside the United States. EPRI hopes to demonstrate similar performance using equipment readily available to domestic inspection vendor companies, and support field applications. These geometrically complex inspections require the use of many specially-designed probes to achieve adequate coverage. Array probes could be used to drastically reduce the number of probes necessary, the inspection time, and/or the mechanical complexity of the scanning equipment. In 1999 EPRI will lay the groundwork for formal demonstration and field deployment of array inspection techniques for pressure vessel nozzles. The use of phased array ultrasonic techniques can improve on the performance of conventional inspection techniques in many ways. Improvements can include reduction in inspection time, reduction in data analysis time, improvements in ease and reliability of data analysis, reduction in the mechanical complexity of scanning equipment, and improvements in the reliability of detecting small defects. 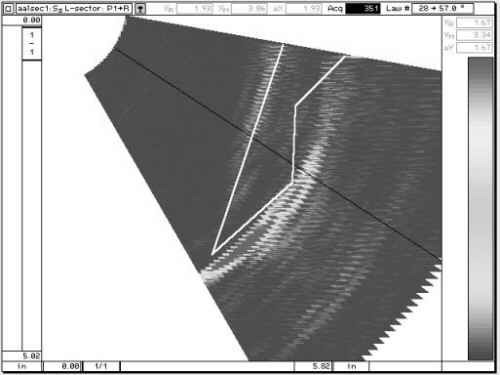 EPRI is simultaneously developing phased array ultrasonic inspection techniques for several power plant components. In some cases, phased array applications have been developed outside the United States, but few are used routinely and very few have been applied in the United States even once. EPRI believes that, with the capabilities of industrial phased array equipment improving and the cost decreasing with each product generation, very soon vendors will be able to offer economically attractive phased array solutions to inspection problems. EPRI will have several applications already developed, demonstrated, and deployed in field trials in order to smooth and speed the process of making these solutions available to its utility customers.